Billie is a Licensed Professional Counselor at Crossroads Behavioral Health. She has worked with Georgia Behavioral Health Professionals for five years. 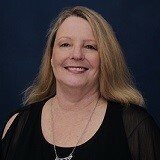 Billie is a Licensed Professional Counselor in the state of Georgia and specialize in treating children, adolescents, and women for depression, anxiety, stress and family issues. She also work with families to address marital issues, behavioral issues, and family dynamic issues. Over the past 25 years, she has worked extensively with the school system and with families providing support for students who struggle with education issues, ADD and ADHD, social skills, anxiety and depression. She graduated from the University of West Georgia with her Bachelor's and Master's degrees in Psychology. Billie has worked as a counselor for 25 years; both in the school system and as a private counselor. She received her M.Ed in counseling from Tulane University and later completed an Ed.S in counseling at The University of West Georgia. Eight years ago, she completed an ABD (all but dissertation) in a counseling doctoral program at North Central University. Billie also has experience with the academic concerns of children and teens in the public and private school system. Billie is affiliated with the American Counseling Association and the South Metro Health Professionals.